With the city preparing reforms for the commercial waste carting industry, the Transform Don’t Trash NYC Coalition of labor and environmental justice groups released a report today calling attention to how private trash trucks disproportionately harm air quality in a few specific low-income communities of color [PDF]. The report, “Clearing the Air,” shows the high concentration of asthma-inducing pollutants at truck-heavy areas in the South Bronx and north and southwest Brooklyn, as well as inside the trucks themselves. To combat those dangerous emissions, the coalition is calling on the city to not only pursue “zone-based” commercial waste collection, but to further incentivize the use of clean-fuel technologies, barges, and trains. More than 250 private carting companies handle commercial waste across the city (residential and government waste is collected by DSNY). But the city’s current commercial waste policies allow private carting companies to contract with businesses anywhere in the city, resulting in vast inefficiencies. Last month, the city announced plans to shift the commercial waste collection to a zone-based system over the next six years. A report from the city’s Department of Sanitation and Business Integrity Commission released concurrently with the announcement found that zone-based collection would cut private carriers’ total annual miles travelled by 49 to 69 percent, or between 11.27 and 15.64 million miles per year. The DSNY-BIC report also showed an overwhelming concentration of truck mileage in the areas studied by Transform Don’t Trash NYC. For the study, local environmental justice groups in those three areas measured levels of fine particulate matter, a carcinogen that causes more than 3,000 deaths each year, according to city Health Department estimates. Their findings prove what many have long assumed: the high concentration of dump trucks brings a high concentration of dangerous pollutants. In the South Bronx, for example, the study observed 304 commercial trucks per hour, of which almost half were hauling commercial waste — meaning one commercial waste truck every 24 seconds. 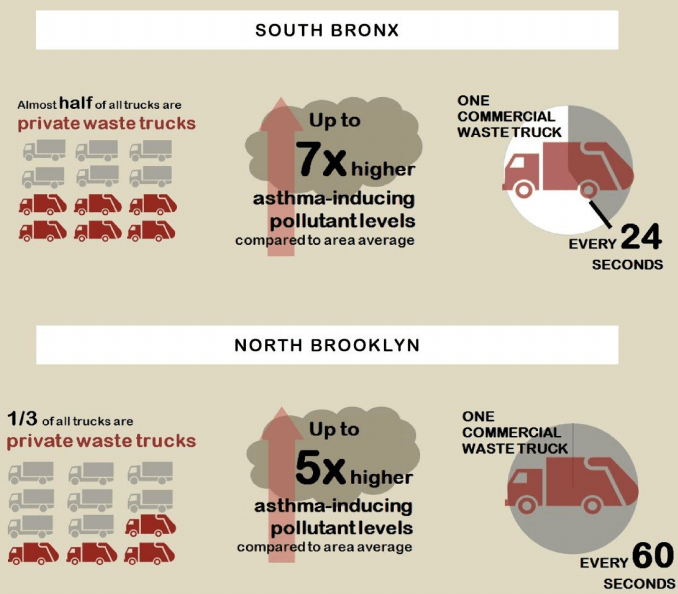 Truck-heavy areas in the South Bronx had two to seven times more pollutants than the neighborhood average. Speaking at a press conference this afternoon alongside members of Teamster Local 813 and representatives from other environmental justice groups, Angela Tovar of The Point Community Development Corporation said that 15,000 to 20,000 diesel trucks enter the Hunts Point neighborhood each day, often on local and residential streets. “This report already confirms things that we’ve known in this community for a very long time,” said Tovar. Thanks Dave for covering important issues like this. There is so much inequity in how infrastructure is doled out in the city and how policies like our horrible sanitation policy affect our residents from traditionally underrepresented communities. Given that most private trash haulers are minority-owned businesses, this is just more regressivism from environmentalists. I’m certain the class of immigrant that takes these jobs would rather have a semi-stable paycheck than slightly cleaner air. And of course the predominantly WHITE unions have a problem with this, as it takes away their job too. Stand on the corner of Bruckner Blvd and Hunts Point Ave and take note of what you see. It’s a crime. This isn’t about race; it’s about environmental degradation. And we all pay a price for that. White lives matter as much as everyone else;s.